Hailing from the urban centre of Mississauga, Joey started canoeing with his mom when he was a little kid. He was a camper, then counsellor at YMCA Camp Pinecrest, where he did his first 20-day whitewater canoe trip at 15. Joey caught the bug and progressed toward guiding long trips. 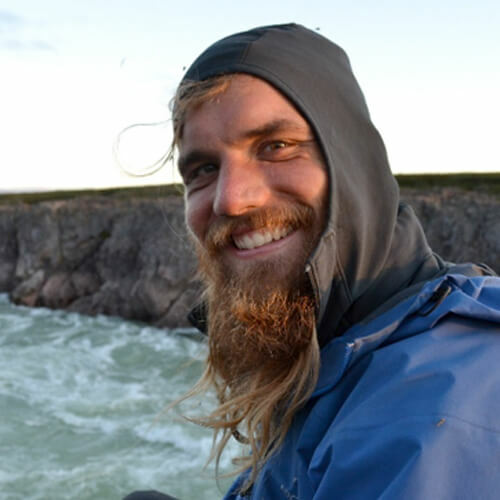 He worked his way up to leading month-long river expeditions in the far north. He also got into paddling kayaks and OC-1s and is a Paddle Canada instructor. Joey has a double major in Outdoor Recreation and Geography from Lakehead University. Living in Thunder Bay, he also developed passion and skills for climbing and fishing. If you can’t find him, go down to the river and you’re likely to see him with a huge smile and a giant fish. Joey is currently working on a Masters of Environmental and Sustainability Education. With his Master’s degree, Joey wants to do meaningful work in education with different populations. You won’t find him in a traditional classroom; he wants to work outside forever and explore for the rest of his life.